Puerto Rico continues to recover from Hurricane Maria as it commemorates 120 years of US occupation (since 1898). In the ongoing post-disaster phase, the island Is becoming a “playground for the privileged,” where disaster-capitalist investors move in as homes foreclose and schools close. AMY GOODMAN: This is Democracy Now! I’m Amy Goodman, with Juan González. Our guests for this hour, Naomi Klein, author of the new book The Battle for Paradise: Puerto Rico Takes On the Disaster Capitalists, launching the new book at Cooper Union, along with all of other our guests and co-host Juan González—Puerto Rican environmental activist Katia Avilés-Vázquez—she’s just up from San Juan—and Elizabeth Yeampierre, executive director of UPROSE and co-chair of the Climate Justice Alliance. Juan? JUAN GONZÁLEZ: I wanted to ask Naomi—one of the things that you mentioned in the documentary was “Who is Puerto Rico for?” And one of the amazing things that’s occurred, largely as a result of Maria, as well, is the foreclosure rate of housing in Puerto Rico. There’s 55,000 people who are in foreclosures in Puerto Rico right now. An average of 14 families a day are into the foreclosure process. JUAN GONZÁLEZ: And this enormous change in property ownership that’s occurring on the island, again, fueled by the Maria disaster. AMY GOODMAN: Evicted from some of their darkened homes? NAOMI KLEIN: Yeah, and also not darkened homes, right? And schools, that parents and teachers have come together to repair, are not being allowed to reopen, right? So the reason why people are being forced off the island is because they have to send their kids to school, they have to find housing. And as we saw in that clip from the documentary, there is a boom going on in luxury housing. There’s all kinds of land grabs taking place. The prices aren’t collapsing for that, but they had collapsed before, so there are all kinds of bargains available. And, you know, this is what we mean by “disaster capitalism” and the exacerbation of the very forces that turned this disaster into this massive human catastrophe. AMY GOODMAN: And you mentioned this before, when your piece came out, “The Battle for Paradise,” but the Bitcoin, the blockchain entrepreneurs that see Puerto Rico as their playground, as this is the future. ELIZABETH YEAMPIERRE: You know, Puerto Rico has always been seen as the recreational center, as an opportunity for the most privileged. It’s been exploited for so many years. It’s not new, it’s just extreme now. And so, we’re seeing that people are descending on the island. Even folks from the diaspora who have wanted to buy property in Puerto Rico are being stopped from doing that, even when they bring cash. It’s almost like they’re putting it all on lockdown so that they can put it on sale for another kind of buyer. And so, the combination of the foreclosures, which is super important—I’m so happy you brought that up, because, literally, there is no suspension of regulations and rules, in the case of an extreme weather event, to make it possible to ensure people’s livability and to make sure that people can stay in their communities. And that, combined with everything else, is really designed just to push people out. Remember, we’re the descendants of what’s called excess population, right? This happened generations ago to our grandparents when they came here. That was to create opportunity for U.S. economic industry, to put in petrochemical industries, to wipe out the agricultural sector. That was done before. And now it’s happening more on a grander scale. And so, I think all of these things are absolutely related. And the idea really is that we’re going to be displaced. We saw it happen in New Orleans, where people were pushed out of New Orleans, African-American communities that were there since slavery. And now what you see is white communities, and environmental and transportation amenities, that should have been serving historical black communities, are not there for them now. And those communities have been spread all over the place. So I think the same thing is happening in Puerto Rico, but at a larger scale. JUAN GONZÁLEZ: And, Katia, I wanted to ask you: In terms of the hope and the resistance of the population, especially around issues of sustainable development and power, what have you seen on the ground in terms of how people have been mobilized to find solutions for themselves? KATIA AVILÉS-VÁZQUEZ: Well, before I go into that, I wanted to highlight that the eviction notices have gone to farmers, too, right after the hurricanes. And just at the moment when they’re the weakest, a lot of—a group of whole bunch of farmers received their eviction notice to leave their farms. So, it’s been—it’s been going on. We’ve had all of the land—almost all of the land in Puerto Rico is at a threat since PROMESA. And now, since the hurricane, it’s kind of like a fire sale, right? So, what we’ve been doing is that one of the main things is trying to get back up. So, if we’re losing land, we’re losing homes, then we need to take land and take homes. So, one of the things that is occurring is people joining collectively to occupy spaces. And there’s a couple of spaces that have been occupied. There’s a group of families that took over a shutdown school and have been actually retrofitting it so that they can turn it into housing. That’s one of the most beautiful examples. But different grassroots groups got together to support each other. And I think that’s the reason that the death count is not higher than it is. It’s precisely because people got together to help each other. We brought each other food and water. AMY GOODMAN: You mentioned schools. I just want to go to one more clip of The Intercept documentary, The Battle for Paradise. This, the president of the Teachers’ Federation of Puerto Rico, Mercedes Martínez, speaking about the secretary of education’s approach to rebuilding Puerto Rico’s schools after Hurricane Maria. MERCEDES MARTÍNEZ: You would imagine a secretary having some kind of sensibility towards our population and saying, “Let’s open the schools. Let’s comfort your children. Let’s bring the teachers back. Let’s get them to talk to the peers.” Well, that’s not what happened. Immediately after the hurricane, the first thing she says is, “This hurricane gives me the perfect opportunity to do the reform that I wanted to do, that I was not able to.” We learned from the experience of Katrina what she was talking about. AMY GOODMAN: That’s Mercedes Martínez, president of the Teachers’ Federation of Puerto Rico. Katia? KATIA AVILÉS-VÁZQUEZ: So, in addition to housing, there’s also been brigades going out to all of the different farms within the islands, Puerto Rico being an archipelago, and supporting the farmers. I mean, it emotionally has a toll, not only physically, to see the work that you’ve been working on for years disappear overnight. So, having that emotional support, bringing filters and trying to get people—like Massol said on the mini-documentary, getting people off the grid and taking advantage of our most important resource, which is the sun. The other one is that these groups, these grassroots groups, that have been popping up and that are supporting each other and are there, are then also tying together, linking with each other. And there’s a couple of initiatives that have come post-Maria, like Junta Gente, that got together in Mariana, which is another area, just like Adjuntas, that has a long history of struggle and social organization. And Junta Gente is—one of the things it’s working on is getting together, linking all of these groups that are resisting, that are facing these capitalists. JUAN GONZÁLEZ: And, Elizabeth, I wanted to ask you about the response of the diaspora in the United States. Clearly, this is not only the beginning of hurricane season, but the annual Puerto Rican Day Parade is coming up this Sunday. And everyone remembers the controversy last year, when all the corporate sponsors pulled out because the parade was having Oscar López Rivera, the freed political prisoner, marching in the parade. This year, what do you expect happening at the parade? And also, in general, the response of Puerto Ricans in the United States to what’s happening on the island? ELIZABETH YEAMPIERRE: Well, thank you for that question, because what we’re doing is very much related to what Katia just raised, which is that, as part of Our Power PR, which is a national initiative that was launched October 11th by the Climate Justice Alliance and a lot of our organizations, including Organización Boricuá, we sent five brigades to Puerto Rico. And in New York City, we created Our Power PR NYC, which is a Puerto Rican diaspora response to sustained engagement in Puerto Rico for the long term. We knew immediately that there would be disaster, but we also knew there was more disaster coming and everybody was really focusing on what was immediate, and we were really invested in the long term. So we’ve done a number of actions, both direct actions, rallies, protests. We’ve had town hall meetings. And then, for the Puerto Rican Day Parade, I think we were really disappointed, that we wanted to have a meeting with the board of directors, because we felt that, unlike other years, that this parade needed to be a direct action. The entire parade really needed to be some—raise attention, on a national scale, on everything that was happening in Puerto Rico. It’s one of those parades that gets national attention. And we didn’t think it was time for celebration. We said—they told us that they would be honoring one town like they always do. And it felt like a Miss America contest. And I said we really needed to focus on 78 municipalities, that it wasn’t enough to do one, and that we really needed to tell the local narrative of what was happening in every town in Puerto Rico. So, Our Power PR NYC will be in the parade, and we will be telling the story of colonialism. We will be talking—we will be telling the story of disaster capitalism. We will be bringing in activists and people from communities from all five boroughs, including Suffolk County, and some people in New Jersey and Connecticut. And our contingent will deliver that message. But in terms of Puerto Rico, we are concerned about the debt. We’re concerned about austerity. We’re concerned about PROMESA. Meetings that are not had in Puerto Rico about Puerto Rico have had in New York City, in Wall Street, and so we see that as our responsibility to step up on behalf of our people on the island. AMY GOODMAN: You’ve got a partnership between colonialism and privatization. Naomi Klein, you write a lot about this when you talk about disaster capitalists, like, for example, of the healthcare system and where it’s headed. NAOMI KLEIN: Well, you know, I think an important point about the numbers around the death toll and so much of it being the result of a collapsed healthcare system is, you know, like we hear from the governor that, “Oh, everything will be fixed with privatization.” This is the line, right? It will be modern. It’ll be efficient. All the problems are due to the system being public. This is a big narrative. But, in fact, the healthcare system was already splintered and privatized and chopped up, and, you know, they’ve done with healthcare what they want to do with electricity, what they want to do with transportation, in so many ways. And the last thing that we could say is that it’s been efficient and modern or effective in any way. AMY GOODMAN: And Junta Gente, in English, means? NAOMI KLEIN: “The People Together,” right? And what it is, is a direct response to this predatory system that has descended on the island to exploit the disaster. And the thing—the reason why this strategy is used is because, you know, these investors know that when people are in that state of emergency, that is ongoing, it’s very hard to engage in political action, to organize. And the most inspiring thing that I saw in Puerto Rico, which, frankly, sets it apart from so many disaster zones, is that deep level of political organization, that predates the storm, that allowed people to respond even when the lights were still out, to come together in these remarkable ways and to start developing a people’s platform, not just saying no to disaster capitalism, doing that—you know, we’ve seen huge protests on May Day, facing enormous repression and resistance—but also saying, “We don’t want that, but we do want this. We have a vision.” And that is what Katia’s work is all about with the food system. So, you know, we’ve touched on a lot of things, but I really want to encourage people, if they’re in New York, to come to Cooper Union tonight and hear more from Elizabeth and Katia. We’re also going to have a representative from the teachers’ union, and just to find out more about this and to support the groups in Puerto Rico who are putting forward. NAOMI KLEIN: And Juan. Of course, Juan. 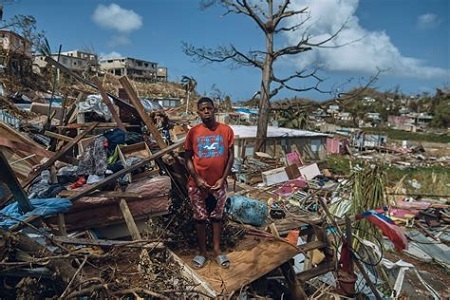 AMY GOODMAN: And, Juan, one of the issues that you speak about so much, in talking about Puerto Rico, this issue, of course, of colonialism, of colonialism of the dead, of the relationship between the United States and Puerto Rico. JUAN GONZÁLEZ: Well, and also the reality that this—as you were saying, the infrastructure was so weakened for so many years that when the hurricane hit, it made it worse. There was just a recent General Accounting Office report that came out, the GAO report, that looked at the financial crisis in Puerto Rico, and it examined 20 of the biggest bond issues that were issued by Puerto Rico, and found that 16 of them were just used to refinance debt. JUAN GONZÁLEZ: They were issuing debt to pay debt. And the Wall Street firms had to know that this is not kosher, this is not the way you do bonding and capital expenditures. So the Wall Street firms very well knew that Puerto Rico did not have the ability to continue issuing this debt, but they underwrote it because they were making big fees. And they figured that the day of reckoning would come way after they, that government, had left office, and the particular financial officials from these banks that issued the debt, after they were gone. So, this was a constant problem that we’ve had in terms of the colonial relationship with Puerto Rico, that this off-the-books operation in Puerto Rico was allowed to continue to function for so long. AMY GOODMAN: And, Katia, your challenging of monoculture in Puerto Rico and what a diversified agricultural system would look like, brought especially into focus when you saw what happened with the hurricane and what people needed afterwards. KATIA AVILÉS-VÁZQUEZ: Correct. There was—it was just a sin to see so many farmers suffering, when you have land to grow and the sun, because the way that we farm was assimilated or was turned around by the U.S. government to serve their purposes. So, one of the things is that we need to sell chemical products, and we need to make sure that we have Puerto Ricans as consumers. And it’s actually been part of U.S. policy to have the Caribbean as a consuming appendage, so that they can sell more, particularly food. So, breadfruit was substituted for potatoes, intercropping systems for monocultures. And what that led to was to having not only starving farmers, but we saw so many moms giving just water to their babies, which can be deadly, not only—for many reasons, right? But then, at the same time that farmers had to throw away thousands of gallons of milk, because there was nowhere to pasteurize them, because the plants were shut down. And this happened all the way into February and March. So, the impact of having a monoculture system and a focus on scale was huge for our farmers. However, the counterpoint to that was precisely that the agroecological farmers, those that had intercropping still, were able to feed their families, were able to actually link with the community centers nearby and to provide food for the collective lunch preparation process. The other thing that happened there was also that the markets were— the agroecological markets could step up, almost immediately, to start connecting with people, and it became a hub for support. So, maybe not that many greens were on the table, but seeing the farmer and seeing your customer was very important for people to heal. AMY GOODMAN: Well, I want to thank you all for being with us, Puerto Rican environmental activist Katia Avilés-Vázquez; Naomi Klein, author of the new book The Battle for Paradise: Puerto Rico Takes On the Disaster Capitalists; and Elizabeth Yeampierre, executive director of UPROSE, co-chair of the Climate Justice Alliance. They’re all speaking tonight, along with Juan González, at Cooper Union in downtown Manhattan on the publication of the book. That does it for our broadcast. Democracy Now! is accepting applications for our paid video production fellowships. Check it out at democracynow.org. Photo: A man who has lived in San Isidro, outside the Puerto Rico capital since he was nine years old, stands for a portrait in his neighborhood, torn apart by Hurricane Maria, on 28 September 2017. Source: Andres Kudacki for TIME.